Congratulations, Andrew,You've received a badge! 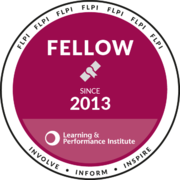 A recognised and acknowledged expert within the Learning and Performance community and beyond. Contributing significantly to the advancement of the Learning profession. Fellow badges demonstrate a minimum 5 years’ relevant experience and a recognised qualification or a minimum of 7 years’ experience. Fellow badges demonstrate that the holder has a commitment to continuous personal development.